A passionate leader can make all the difference to a nonprofit organization focused on promoting sustainability. Roxanne Williams, Executive Director of City Sprouts, bubbles over with excitement about the great things happening in her North Omaha neighborhood. “It’s like all the things I’ve done all my life just all came together in this one perfect opportunity. I get to work with students, I get to grow things and help people have access to fresh fruits and vegetables,” says Williams. Williams joined City Sprouts, established in 1995, as its one full time employee in 2012. She brings a background of horticulture, gardening, education and volunteer management with her. 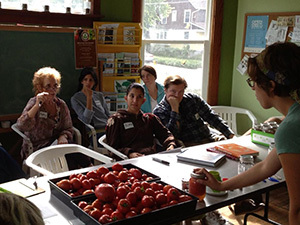 Along with a part-time farm manager and community garden manager, Williams creates educational, food-based programming for all ages and backgrounds in the Orchard Hill community. City Sprouts began after the Orchard Hill neighborhood’s downturn into drugs and violent crime resulted in several shooting deaths, including the death of a young man who died on the lot where the City Sprouts community garden sits today. “Concerned neighbors gathered together to change a place that had been a source of death and despair into a garden of hope and growth,” says Williams. The community garden sits on a half-acre city lot and is comprised of 46 raised beds, a fruit tree perimeter and a perennial plant border. The garden is organic, relying mainly on regular maintenance and abundant compost donated by local neighborhood residents. The garden uses both city water as well as water collected from rain barrels onsite and from the adjoining property. On the lot sits a three story home built in 1906, which houses the staff offices as well as a ground floor kitchen used for monthly pot lucks and weekly presentations on gardening, cooking and adopting a sustainable lifestyle. One block north of the community garden, City Sprouts has an urban farm built on three city blocks. The farm is run by a manager as well as approximately ten student summer employees who receive an education in agriculture as well as business and job readiness skills. “As food grows they harvest it and present it at an onsite farmer’s market and sell to the neighbors. They get the business experience from seed to table in terms of producing food for people in need,” says Williams. City Sprouts offers a job reference, resume help as well as financial planning to their young growers. Three of last year’s ten student employees will return for a second season. Like many population centers, Omaha is home to a large immigrant community looking for ways to both assimilate into their new world while retaining the traditions of their home country. A half acre of City Sprouts’ farmland is home to the growing efforts of 21 refugee families to cultivate native foods and keep established farming skills alive. Many of the refugees are still learning English. “But a delicious ripe red tomato is the same in any language,” Williams points out. With one full-time staff member and two part-timers, Omaha Sprouts relies heavily on the support of Omaha’s volunteers. “We have thousands of volunteers every year that give over 3,000 hours of volunteer service,” says Williams. “There’s no shortage of work. We love to have people come out and see what’s going on.” A fall fundraiser and the Day of Giving program raise awareness and work hours as well as funding. With a 65 percent occupancy rate, it’s been a challenge for City Sprouts to retain a consistent community relationship, but as established programs become better attended and homeownership in the neighborhood increases through city investment, home building by Habitat for Humanity and the renovation of older buildings by new businesses, news of the organization’s work has spread. Williams can expect at least 10 to 12 community members at every program or event. “We’re looking to impact neighbors one by one, one family at a time,” she says.